There are many of reasons to consider an ultralight wheelchair. If you are a caregiver responsible for transporting an older parent, for instance, you know having a light wheelchair makes your job significantly easier. If you’re a senior who prefers to get around without help, on the other hand, you know having a wheelchair that’s easy to propel and navigate is a huge benefit. We’ve found some of the lightest wheelchairs on the market at affordable prices, and we’re reviewing every single one of them. We’re also explaining how we decide which wheelchair makes the list. Keep reading to find out our picks for the best ultralight manual wheelchairs. What Type Of Wheelchair Should You Use? How To Know If A Wheelchair Is The Right One? This chair features a nice wide seat and a ton of other options that are uncommon like clippable leg guards and a cup holder. This 19-inch wide seat transport wheelchair gives you everything you need, plus some additional space on the seat for those who need it. It features swing-away footrests as well as a cup holder for drinks and other items. When you do not need the footrests or the cup holder, everything unclips easily and can be stored right on the side of the chair. The armrests on this chair are not removable, which at first seems like a significant downside to a transport wheelchair, but they have a slope at the end that still allows you to get under tables and counters. There is an ample amount of padding to keep pressure off the tailbone and lower back, but like most transport wheelchairs it does not have enough to keep you comfortable for too long. This is a great option for temporary use, but most seniors will want something with more cushion if they plan to use it long-term. 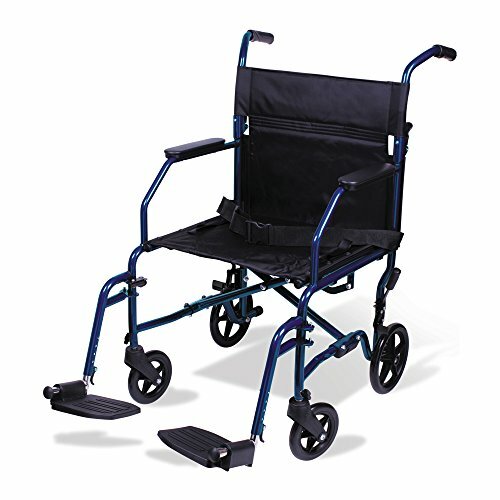 This basic wheelchair is narrow as to fit into small spaces but it does not navigate well on most outdoor surfaces. This chair from Drive Medical weighs only 19 pounds, making it one of the lightest chairs we have ever seen, although it lacks some of the features its competitors offer. The seat of this wheelchair is only 14.5 inches, which means it’s only suitable for smaller users., and it offers no features other than footrests and a seatbelt for those who need it. All in all the chair feels nice and sturdy, but it is very basic. One thing we didn’t like about this chair is the 8-inch composite wheels. These do not turn well and are entirely useless on any outdoor surface. If you or the senior you’re shopping for are looking for a basic chair that is compact and affordable, this is a great option. This chair is lightweight and folds up nicely but it does not come with any of the comfort mechanisms that other chairs of this price do. This chair is designed to be used entirely as a transport chair. It does not feature any padding or comfort measures other than short elbow-length armrests. It serves its purpose when used indoors to transport patients, but isn’t capable of much beyond that. It does fold up nicely and quickly; however, you have to remove the wheels to fold it up thoroughly and then carry the wheels in a separate bag. This wheelchair is one of the least versatile, but if you’re only looking for a temporary wheelchair for indoor use, this is it. For a budget wheelchair this one provides all your basic needs. For a budget wheelchair, we liked this one. 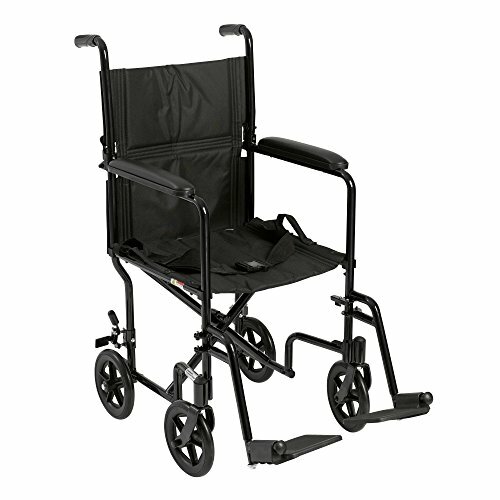 It delivers everything seniors need in a standard transport wheelchair without the high price tag. The chair feels durable when you sit down, and you do not worry that it is going to collapse from beneath you. There is a good amount of padding in case you have to spend a significant amount of the time in the chair and it comes with swing away footrests as well. This chair serves its purpose as being a quality transport chair without all the bells and whistles. Though it’s not a great long-term solution for most older adults, it may help out in a pinch. This rigid wheelchair is a great option for someone looking to maintain their independence and navigate easily through the outdoors. These rigid chairs are meant to be lightweight and easily mobile with large back tires that allow you to move around. The chair is designed to look sporty and stylish with an aluminum frame. Everything on this chair is adjustable, from the height of the chair to the angle of the back, so you are in an ideal position when you venture off in it. The chair also features a 265-pound weight capacity, which is more than most lightweight chairs. These chairs are the ultimate in mobility, and we experienced no issues getting around on this. The tires roll effortlessly, and there is a ton of stability to prevent you from tipping over on an uneven surface. 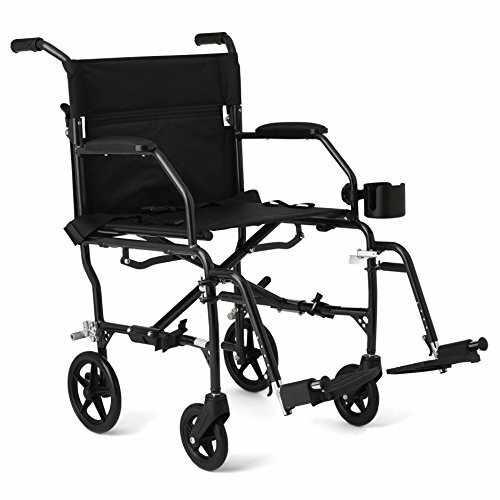 Designed to be self-propelled, this chair is a great option for an active senior with good upper body strength. The TiLite is the ultimate in self mobility chairs. The user will have no problem maneuvering themselves around independently using this chair. This chair is outrageously light, weighing in at only 9.3 pounds, and it can be customized from top to bottom to meet the unique needs of each user. It is a great option if you are looking to maintain independence and get around quickly and easily. The chair comes in a variety of sizes, but the standard is a 16- x 16-inch frame with 24-inch rear wheels. This smaller chair only weighs 7.6 pounds. This chair features a nicely padded backrest, which makes it more comfortable for extended periods of sitting than other options. There is also a push button tire removal system, which makes this chair even easier to maintain. Do you require a chair with a specific weight capacity or one with a wider seat? Some lightweight chairs are designed to be small on purpose so they can have that weight, but a lot of chairs offer variations. There are so many different types of wheelchairs with different variations, and not everything will work for you. Let’s go into more detail on the different types of chairs. Self-propelled chairs allow you to wheel yourself around using the large back tires, which are typically 24 inches in size with hand grips that surrounding the entire diameter of the wheel. These wheelchairs are much better for outdoors and varying terrain. Transit chairs are the ones you typically see in hospital and nursing home settings. These are a standard size with manual brakes on the wheels, and they’re typically designed to be pushed rather than rolled manually by the user. These chairs also fold nicely for transport because that is their intended purpose. These chairs are made to take a person from one place to another but not for long-term sitting. Within these two primary areas, there are several different chair variations, which we will cover here. These are your most standard chair. They can typically be folded up and weigh around 25 pounds. They often come with features like leg rests, padded armrests, and foot holders. The size of the seat varies depending on the manufacturer, but it’s typically between 16 and 18 inches. These are your most standard chairs. They can typically be folded up and weigh around 25 pounds. They often come with features like leg rests, padded armrests, and foot holders. The size of the seat varies depending on the manufacturer, but it’s typically between 16 and 18 inches. Heavy duty chairs are primarily for Bariatric purposes, and they offer more full seats and a reinforced body. This results in a heavier chair ranging from 30 to 75 pounds. Weight capacities on these chairs are much higher as well, upwards of 600 pounds. If you are searching for an ultra lightweight wheelchair, then you will have different things in mind when compared to someone searching for a heavy-duty chair. These factors need consideration when you are picking out a chair for yourself or your loved one. This is the obvious one; you want a chair that is travel-friendly, but maybe you also need one where the user can transport themselves. 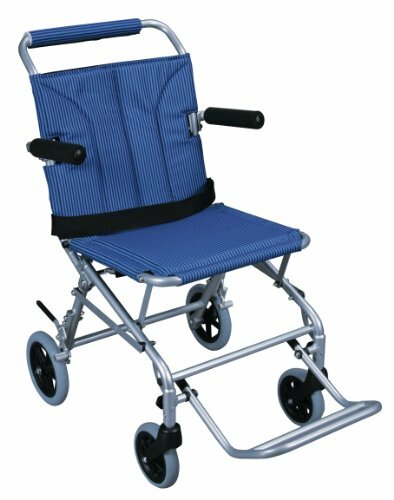 If you are a caregiver and will be pushing an older loved one around all the time, then a lightweight transport chair is the right option for you. If you are the user and plan on maintaining as much of your independence as possible, you’ll want to get a Rigid chair or another one of the ultralight titanium framed chairs. When you are navigating your way around outside on your own, you do not want to have to worry about the chair tipping over. Stability is vital for you, and sometimes when you sacrifice weight on a chair, you also sacrifice stability. A lot of the ultra-lightweight chairs tip easily so if you are looking for something to navigate yourself you should lean towards a Rigid chair or something with a similar frame shape. While most transport chairs are not intended for the long-term use, you can still get some nice comfort features out of them. Make sure the chair comes with plenty of padding to keep you comfortable when you do have to sit for a long time. Also, keep an eye out for chairs with padded armrests and calf rests as well. These are nice, and they relieve pressure points on the body. Do you require a chair with a specific weight capacity or one with a wider seat? Some lightweight chairs are designed to be small on purpose,, but a lot of chairs offer variations. If you can, definitely opt for a chair that allows for customization. A lot of the Sunrise Medical chairs are fully customizable, and they work with you to make sure the chair fits you perfectly. Ultralight wheelchairs are a solid option for independent seniors who want to propel themselves, as well as for caregivers who will primarily be pushing their loved ones. These chairs are ideal for short-term use and travel, since they’re designed to be compact, foldable, and light. There are many excellent models on the market right now, which means seniors will be able to find exactly what they need.